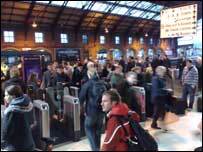 Rail commuters have taken part in a fare strike in protest at overcrowding, high prices and unreliable First Great Western (FGW) trains. Bristol-based passenger group, More Train Less Strain (MTLS), organised the day of action on Monday. FGW said fewer than 100 people had refused to pay, but MTLS said the protest had been to make a point. FGW blamed ageing rolling stock and staff shortages for many problems, but said it was also investing £200m. The firm previously said it was doubling some compensation for poor service. MTLS claimed this was a publicity stunt to try to head off protest action. "We do share the frustration of a lot of ordinary passengers," said Andrew Griffiths, FGW regional manager. "Our performance hasn't been good enough - we're the first to put our hands up and admit that." Commuters from Bristol and Bath took part last year, but this time protests also happened at about 20 stations including Yate, Frome, Highbridge, Trowbridge and Warminster. 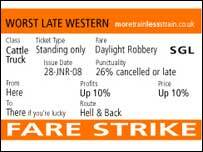 About 10,000 tickets bearing slogans such as Worst Late Western and Route To Hell And Back were printed for passengers instead of proper tickets. Peter Andrews, from MTLS, said: "People travelled on the tickets to London, Birmingham and Penzance. "We made a lot of fuss, smoke and noise and hope FGW has listened to us and realises the depth of feeling. "It is a way of hitting back because we have tried to speak to them and meet them to get them to do something about the state of their services." Mr Griffiths added: "People are allowed to protest but we can't compromise safety. The RMT said passengers have "every right to feel short-changed"
"We will take the names and addresses of everyone without a valid ticket and decide later on whether to prosecute." The maximum sentence is a fine of £1,000 or three months imprisonment. Geoff James, 34, was turned away at the gate trying to get to Yate: "The service is rubbish. They won't provide a decent service at a decent price. I'll have to buy a ticket now as I have to get to work." The protesters have been backed by rail union RMT, which said passengers had "every right to feel short-changed". "[The] company... proves that franchising cannot deliver the railway Britain needs," said General Secretary Bob Crow. However, FGW said it was working towards addressing the problems. In a statement, it said: "We are investing £200m to improve trains and stations. We are recruiting more drivers and guards to boost reliability."